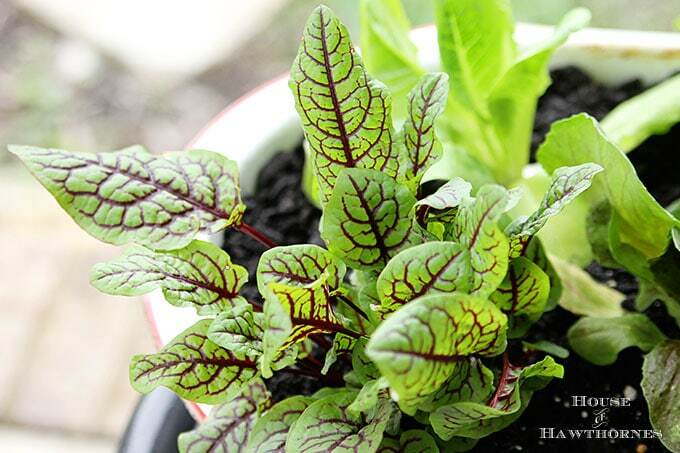 Growing lettuce is one of my favorite spring gardening projects. There’s nothing like walking out your back door, ripping off a piece of lettuce, throwing it into a bowl and having lunch. It makes me feel all green and organic like. 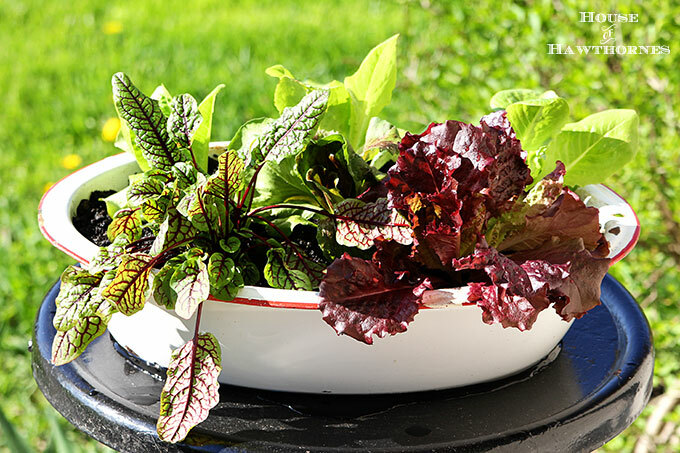 I prefer to grow my lettuce in containers, like this old enamel basin, rather than in the ground. Basically because of the pesky bunnies that live just outside the fenced yard. They’re sort of like Peter Rabbit. Except they don’t wear clothes, they don’t have books written about them and they aren’t millionaires. He did get royalties didn’t he? My bunnies are just your ordinary, run of the mill, thieving kind of rabbits. So I just prefer to keep them honest and go the container gardening route these days. 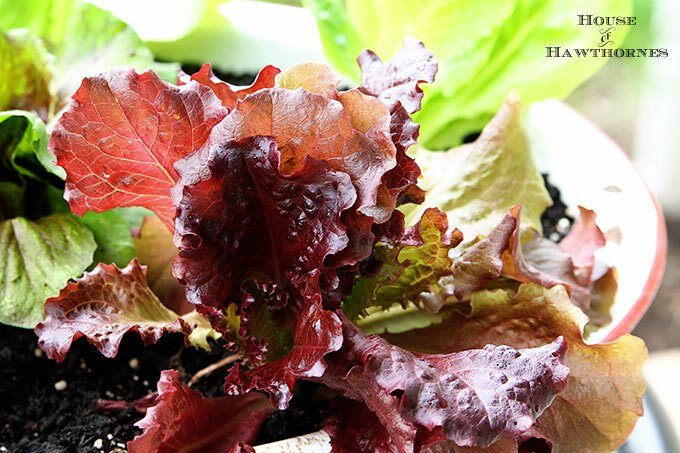 Lettuce, like most plants, enjoy drainage though. No one wants their feet permanently wet. So if you want to plant in something like a cool enamelware bowl you found at an estate sale you will need to either drill some drainage holes in it or make sure it’s a rusty, holey bowl like mine was. I lined the bottom with coffee filters since my rusty holes were fairly large in some spots. And then filled the basin up with organic soil made for gardening. 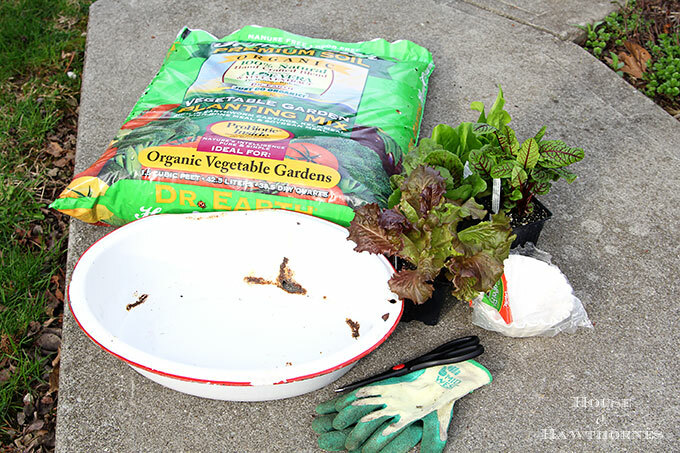 In this case I used Dr. Earth’s Organic Vegetable Planting Mix, because it’s what the garden center guy recommended. You don’t have to go organic, but you do need to buy something for veggies rather than typical potting soil for flowering plants. And then I just planted the lettuces in the dirt. You can check out my lettuce that I grew in a colander a few years ago at Growing Lettuce In A Colander. 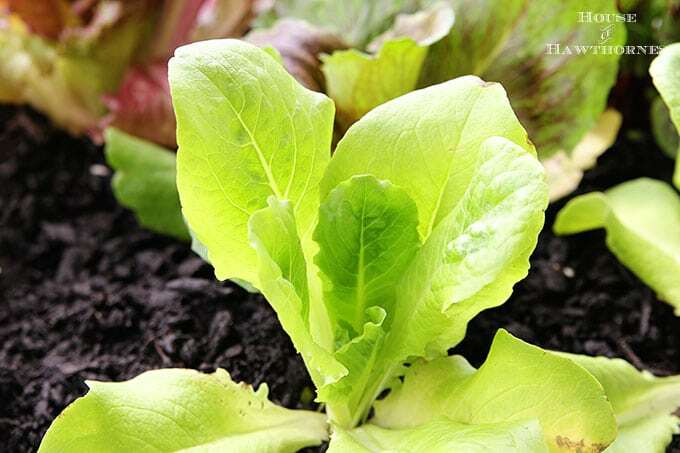 This wonderful video from Gardenerd on How To Harvest Buttercrunch Lettuce, because I don’t know about you, but I tend to let the lettuce stay on the plant a little too long and next thing you know you’re growing flowers instead of food. 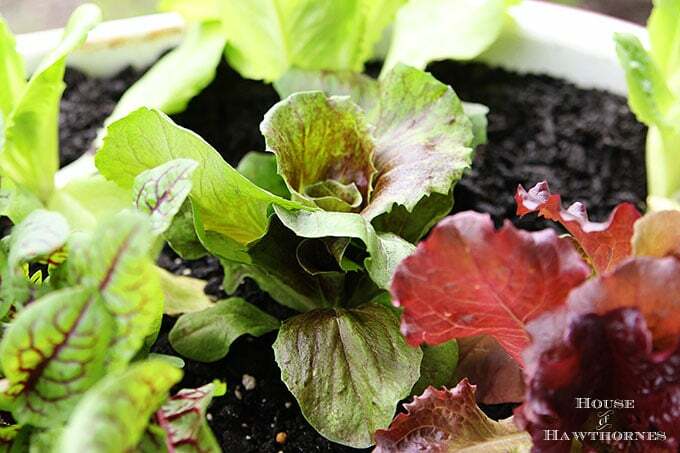 And my friend Melissa of Empress Of Dirt has a great tutorial on growing lettuce called Grow Cut And Come Again Salad Greens. Do you enjoy growing your own? Or do you prefer the kind that comes in a bag? 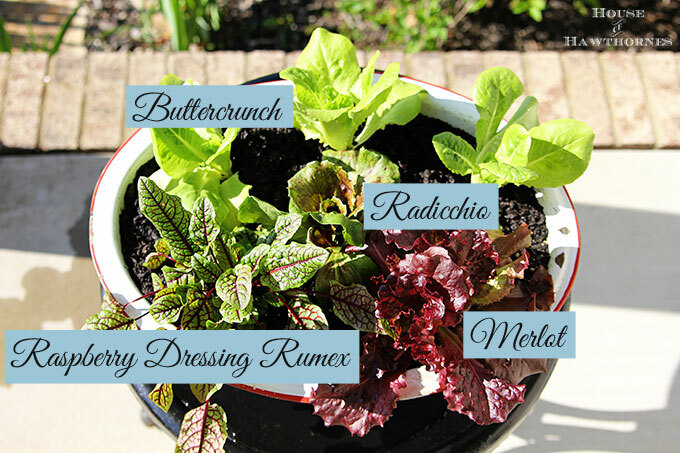 I’ve never grown lettuce in containers before…and I love the idea! I need to start looking for some fun containers! I used to grow lettuce years ago. Yours looks perfect. I love container gardening too. Very convenient. Because our back woods/gardening area has become a salad bar for our woodland friends, I think we might start trying container gardening this year. Happy May 1st! Never would have thought to do this Pam. My younger son Jack loves Salads of all kind. I will have to try this.